Sell your stock at our Garden of England event. A weekend fair that attracts buyers (and dealers) from across the county, country, continent and beyond. Being under an hour from both Gatwick and Dover our Detling Fair has a truly cosmopolitan feel. Buyers flock to the event five times a year from the UK, Europe and further afield. 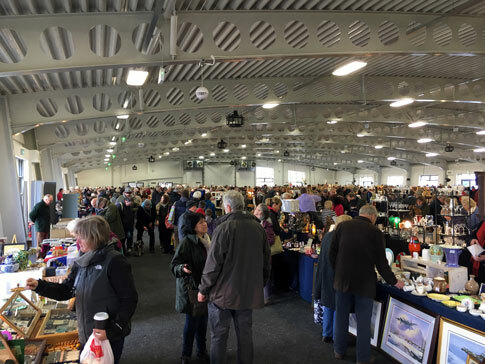 With two indoor halls, as well outside pitches, shopping arcades and tentage, whatever your preference, this fair is an excellent opportunity to trade. Single Stand - 10ft x 5ft - £124. One 6ft table supplied. Double Stand - 20ft x 5ft - £187. Two 6ft tables supplied. Space only, no tables are included. Two tables and an overhead light are included. Must be booked at least 2 weeks before the fair. £ Price available on application. Outside Pitches - see pitch layout by clicking on the plan below. Pre-paid pitches must be booked before noon on the Thursday prior to the event. NO CHAIRS ARE PROVIDED FOR ANY STALLS AT DETLING. Download our Detling 2019 booking form, which has the new prices for 2019. Simply, print it, complete and return to us by post, making sure you have included payment details and taken note of the payment processing date. Saturday: Early entry: 8:30am – 10:00am, £6pp. Sunday: General entry: 10:00am – 3:30pm, £4pp. All Exhibitors to park in your allocated queue - from 9:00am. Marques, Shopping Arcades, Maidstone Exhibition Hall Furniture Pitches access from 9:00am. John Hendry Table Top - access building from 10:15am. Maidstone Exhibition Hall Table Top - access building from 10:30am. Pre-paid Numbered Outside Pitches - access site from 12:30pm. Cash only pay at the gate. Access to showground is at any time. Overnight security on the gate will sell a ticket to you. You will then be parked onto the next available pitch.